The Residential Sales Representative takes charge of selling the company’s product and service to customers in a particular location mainly residential areas. The job description of these representatives involve designing strategies for lead generation, creating plan of action and executing it, developing attractive promotional campaigns, making unlimited sales, showcasing products to customers, attending to customers queries, resolving issues, maintaining cordial relation with customers, interacting with existing customers whenever there is a new product development, and ensuring maintenance of professional standards in marketing. 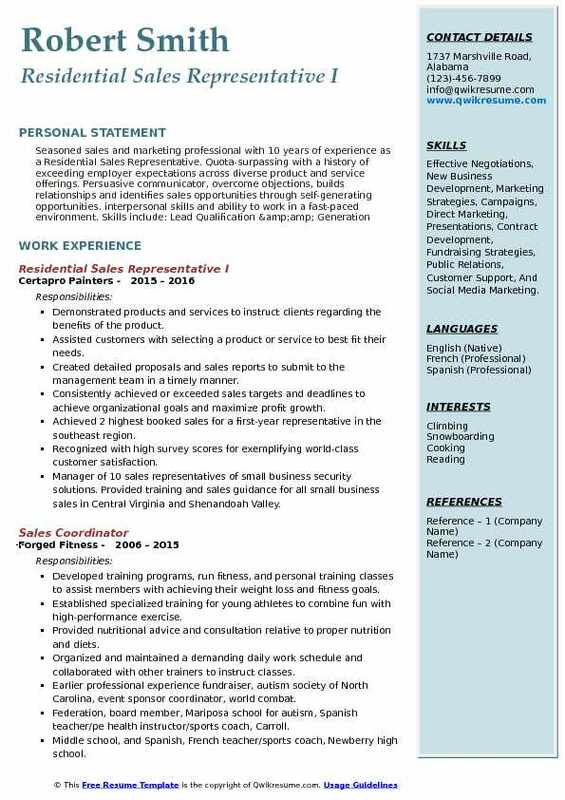 The representative covering this field of residential sales should mention in the resume skills that include the ability to reach goals, good marketing skills, strong communication skills, strong persuasive skills, high level of confidence, strong time management skills and bi-lingual skills. 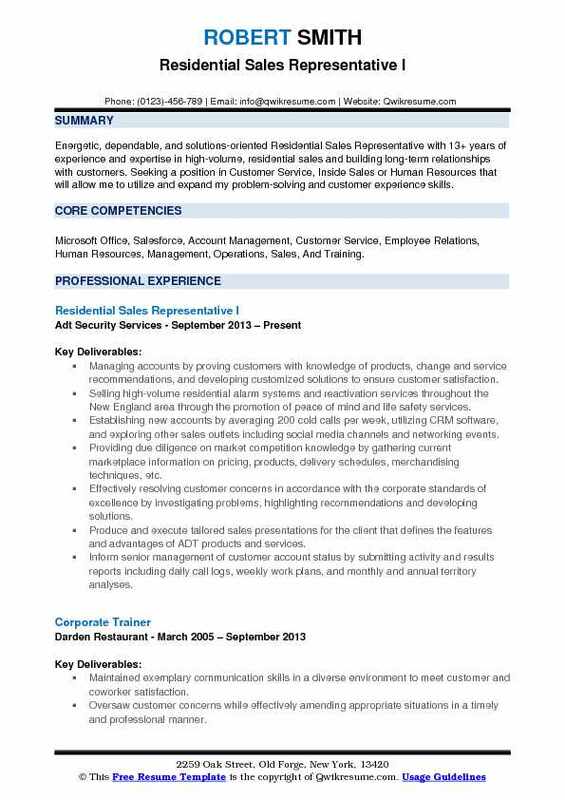 Most of the successful Residential Sales Representative Resume mentions a college degree in sales, marketing or its equivalent. Summary : 11+ years of experience as a Residential Sales Representative is seeking to obtain a position allowing me to utilize my degree and experience to become part of a growth-oriented team focused on health. Skills : Negotiating, Closing, Organizing, Multi-tasking, Presentations, Microsoft Office, Arc Welding, Assembly, Customer Service, Forklift, Inspection, Management, Self Starter, And Self-Motivated. Outbound sales call to customers homes offering a customized security need analysis and provide quotes. Goals include closing over 50% of all leads, obtaining at least 4 leads per month that are self-generated (cold calling), as well as selling over 15 units per month. As a goal-oriented sale representative, I have reached or exceeded my goals each month. Leading closer and obtainer of self-generated leads each month since the start of my sales career with ADT. Responsible for prioritizing all appointments, being punctual, and taking time to overcome any customer objections. Ability to communicate with potential and existing customers in person, over the phone, and via e-mail. Responsible for completing paperwork that is assigned to each sale quickly and efficiently in order to keep the line of communication running strong between the entire team (installers, managers, schedulers, etc). Consistently contact customers after installation to ensure their highest level of satisfaction. Summary : Energetic, dependable, and solutions-oriented Residential Sales Representative with 13+ years of experience and expertise in high-volume, residential sales and building long-term relationships with customers. Seeking a position in Customer Service, Inside Sales or Human Resources that will allow me to utilize and expand my problem-solving and customer experience skills. Skills : Microsoft Office, Salesforce, Account Management, Customer Service, Employee Relations, Human Resources, Management, Operations, Sales, And Training. Managing accounts by proving customers with knowledge of products, change and service recommendations, and developing customized solutions to ensure customer satisfaction. Selling high-volume residential alarm systems and reactivation services throughout the New England area through the promotion of peace of mind and life safety services. Establishing new accounts by averaging 200 cold calls per week, utilizing CRM software, and exploring other sales outlets including social media channels and networking events. Providing due diligence on market competition knowledge by gathering current marketplace information on pricing, products, delivery schedules, merchandising techniques, etc. Effectively resolving customer concerns in accordance with the corporate standards of excellence by investigating problems, highlighting recommendations and developing solutions. Produce and execute tailored sales presentations for the client that defines the features and advantages of ADT products and services. Inform senior management of customer account status by submitting activity and results reports including daily call logs, weekly work plans, and monthly and annual territory analyses. Ensuring customer retention goals are met by affirming customer satisfaction post-installation. 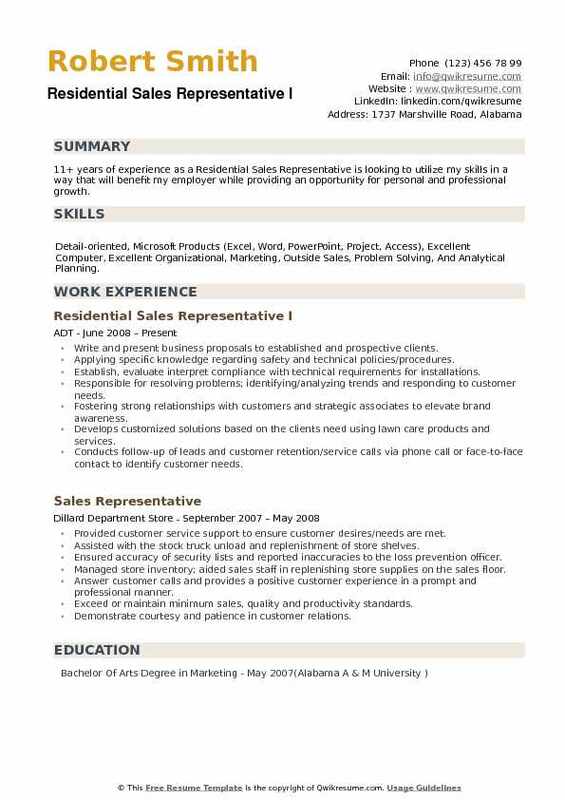 Objective : One year of experience as a Residential Sales Representative is looking to obtain a position for an employer looking for a creative, enthusiastic, and energetic team member; because I am currently enrolled in college, seeking employment for a company with flexible scheduling. Skills : Microsoft Office, Customer Service, Sales, Project Management, Sales, And Material Handler. Implemented the company selling strategy when communicating with clients and assessing potential sales opportunities. Accurately submitted and processed invoices through proper channels of management; followed stringent guidelines regarding privacy of personal consumer information. Calculated and reported closing sales numbers, consumer invoices, hours worked, mileage, and customer contact rate daily. Regularly follow up with consumers based on availability, addressing customer inquiries, and quickly resolving consumer complaints. Promoted awareness of products and services to current and prospective customers based on individual needs. Received recognition for being top up-selling sales representative within the region. Raised area sales by generating leads for outside sales representatives. Time management, punctuality, and scheduling when meeting consumer and employer expectations. 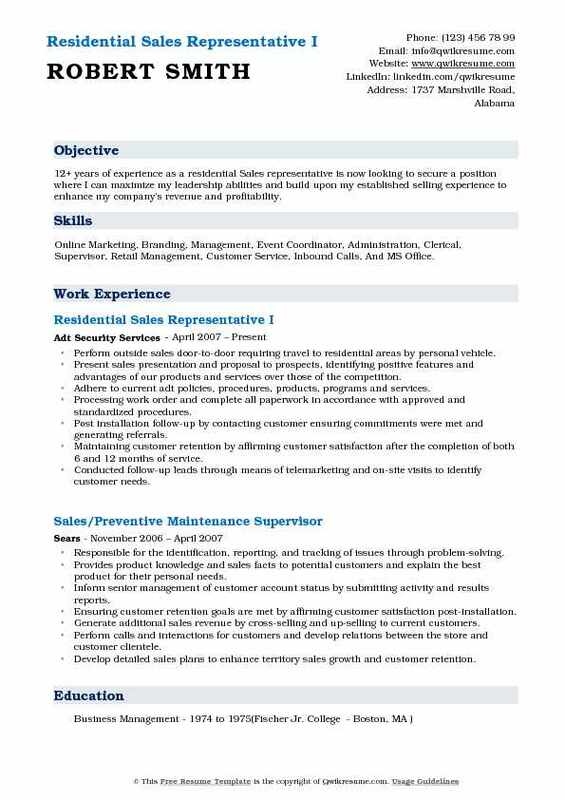 Objective : 2 years of experience as a Residential Sales Representative is seeking to contribute experienced training in management services of retail operations, sales, and customer service skills with an organization where I can advance the mission and objectives of that organization. Skills : Fluent In Spanish, Legal Familiarity, Document Management, Microsoft Office Package, Mac Package, Office Administration, Self Motivation, Client Prospecting via Phone, And Networking. Sell new products, and work to meet or exceed sales quotas for the company while making a difference by helping others protect what matters most to them. Present innovative security solutions to customers, connecting with them and building a network of overall customers in the leading security company that focuses on innovation and expansion of their market share. Tenacious negotiator and closer adapt in conveying the benefits of products/services and generating customer interest, overcome obstacles, and close deals quickly. Acquiring new customers with company reactivate existing ADT equipment for new customers and establish a long-term loyal customer base. Negotiating prices, terms of sales and service agreement; and maintain account acquisition and retention. Selecting the correct products for customers in accordance with their needs, product specifications, and applicable regulations. Maintaining good working relationship with managers, administrations, sales representatives and installation staff. Training to sales representatives in the field work, assigning territory and creating lead sheets for the sales team. Skills : Effective Negotiations, New Business Development, Marketing Strategies, Campaigns, Direct Marketing, Presentations, Contract Development, Fundraising Strategies, Public Relations, Customer Support, And Social Media Marketing. Demonstrated products and services to instruct clients regarding the benefits of the product. Assisted customers with selecting a product or service to best fit their needs. Created detailed proposals and sales reports to submit to the management team in a timely manner. Consistently achieved or exceeded sales targets and deadlines to achieve organizational goals and maximize profit growth. Achieved 2 highest booked sales for a first-year representative in the southeast region. Recognized with high survey scores for exemplifying world-class customer satisfaction. 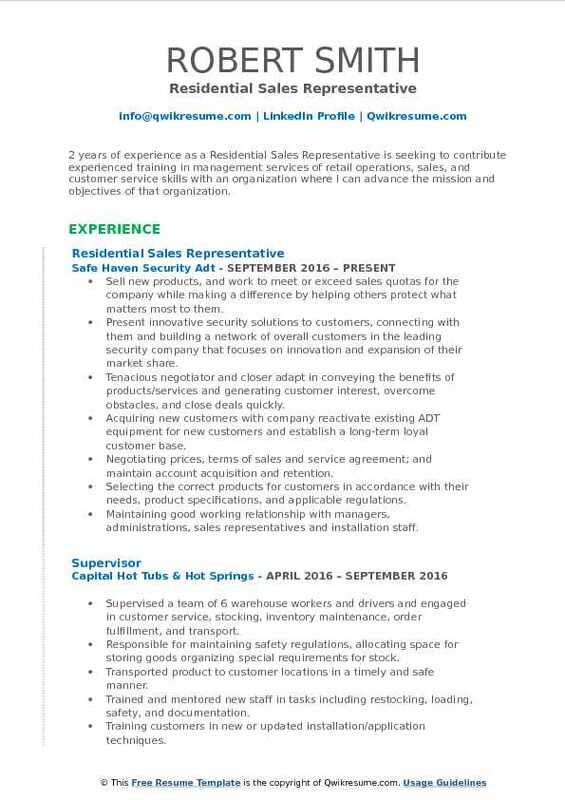 Manager of 10 sales representatives of small business security solutions. Provided training and sales guidance for all small business sales in Central Virginia and Shenandoah Valley. Conducted follow-up leads through means of telemarketing and on-site visits to identify customer needs. 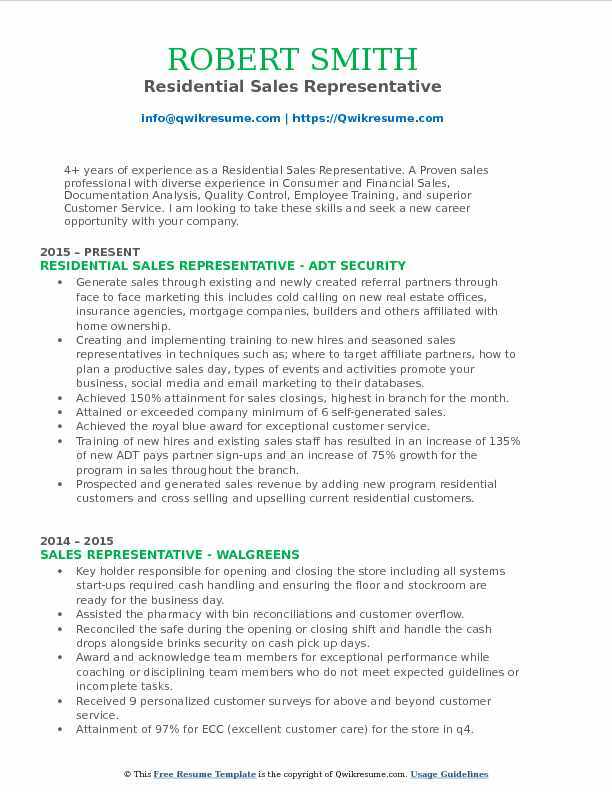 Summary : 12+ years of experience as a residential Sales representative is now looking to secure a position where I can maximize my leadership abilities and build upon my established selling experience to enhance my company's revenue and profitability. Skills : Online Marketing, Branding, Management, Event Coordinator, Administration, Clerical, Supervisor, Retail Management, Customer Service, Inbound Calls, And MS Office. Perform outside sales door-to-door requiring travel to residential areas by personal vehicle. Present sales presentation and proposal to prospects, identifying positive features and advantages of our products and services over those of the competition. Adhere to current adt policies, procedures, products, programs and services. Processing work order and complete all paperwork in accordance with approved and standardized procedures. Post installation follow-up by contacting customer ensuring commitments were met and generating referrals. Maintaining customer retention by affirming customer satisfaction after the completion of both 6 and 12 months of service. 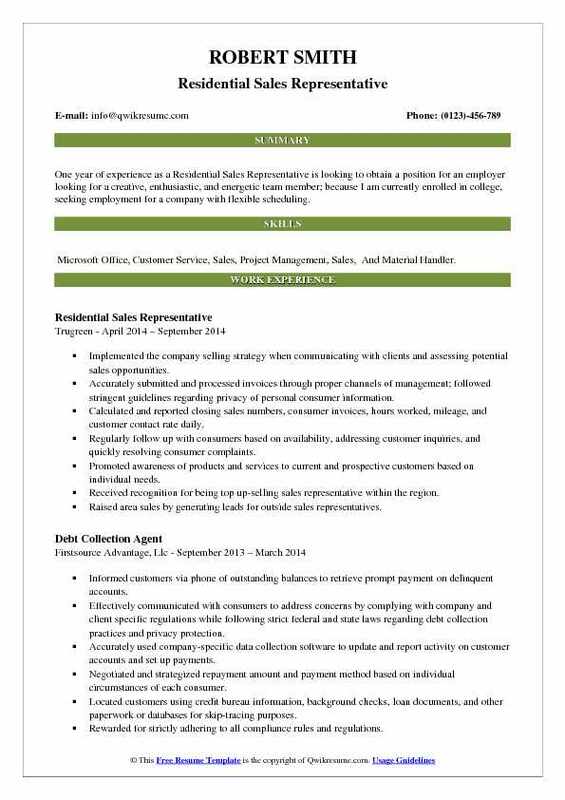 Objective : 4+ years of experience as a Residential Sales Representative. A Proven sales professional with diverse experience in Consumer and Financial Sales, Documentation Analysis, Quality Control, Employee Training, and superior Customer Service. I am looking to take these skills and seek a new career opportunity with your company. 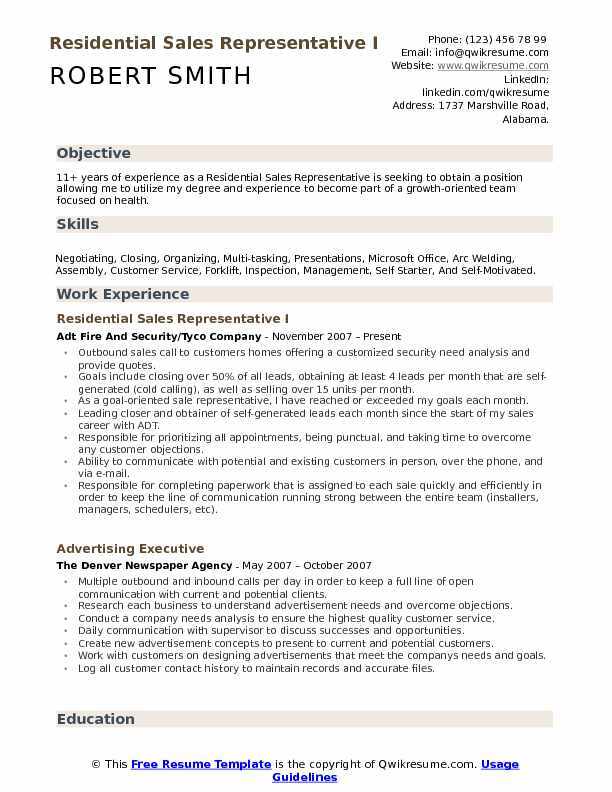 Skills : Sales, Marketing, Sales Management, Trainer, Customer Service, Organizational, Strong Organizational, Scheduling Appointments, Excellent Computer, And Analytical. Generate sales through existing and newly created referral partners through face to face marketing this includes cold calling on new real estate offices, insurance agencies, mortgage companies, builders and others affiliated with home ownership. Creating and implementing training to new hires and seasoned sales representatives in techniques such as; where to target affiliate partners, how to plan a productive sales day, types of events and activities promote your business, social media and email marketing to their databases. Achieved 150% attainment for sales closings, highest in branch for the month. Attained or exceeded company minimum of 6 self-generated sales. Achieved the royal blue award for exceptional customer service. Training of new hires and existing sales staff has resulted in an increase of 135% of new ADT pays partner sign-ups and an increase of 75% growth for the program in sales throughout the branch. Prospected and generated sales revenue by adding new program residential customers and cross selling and upselling current residential customers. Objective : 2 years of experience as a Residential Sales Representative is seeking to obtain a mutually beneficial position where I can use my strong negotiation and communication skills. Skills : Strategic, Analytical Planner, Relationship Building, Disability & Diversity, Advocate Training & Development, Event Planning, Marketing, Microsoft Office Suites, Google Drive, Data Sharing, Social Media Savvy, And Public Speaking. Sold products within assigned territory, maintaining assigned sales quota and following established guidelines. Created of sales "funnel" by utilizing phone, field, and creative lead generating techniques. Presented the full ADT portfolio of products and services at each sales call. Implemented customer acquisition tactic with prospects to utilize closing techniques to leverage sales build relationships for referrals. Conducted post installation follow-ups and continuous customer contact efforts to help maintain long-term customer retention by affirming customer satisfaction. Develop detailed sales plans to enhance territory sales growth and customer retention. Increase profit margins by implementing strategic negotiating contract orders. Set up weekly meetings with businesses, contractors, and home remodeling companies. Headline : Accomplished sales professional with over 5 years of experience as a Residential Sales Representative working within various environments. A natural leader with a hunter mentality, relationship management skills, and a drive to succeed. Seeking a challenging position which will fulfill my goal to advance my skill set and achieve the next level. Present security solutions to current and potential customers both in the field and over the phone. Schedule individual appointments around company scheduled appointments to fill calendar and manage time efficiently. Designing home security systems to find solutions to individual customer needs. Following up with customers to provide service as well as obtain customer referrals. Stay up to date on all current security technologies and data to provide the most current security information to all customers. Sales of security equipment to new and existing customers in their home. Process contracts and follow up with installers and administrators on customer status. Helped to train new team members. Oversee sales meetings and other sales team activities such as call night in the absence of the sales manager. Assisted customers by answering questions and service concerns as well as quoting prices and encouraging customers to buy. 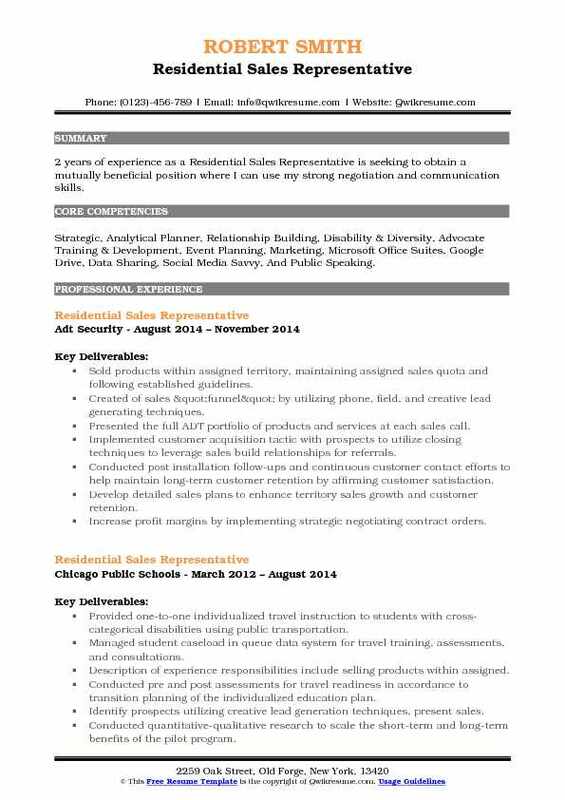 Summary : 11+ years of experience as a Residential Sales Representative is looking to utilize my skills in a way that will benefit my employer while providing an opportunity for personal and professional growth. 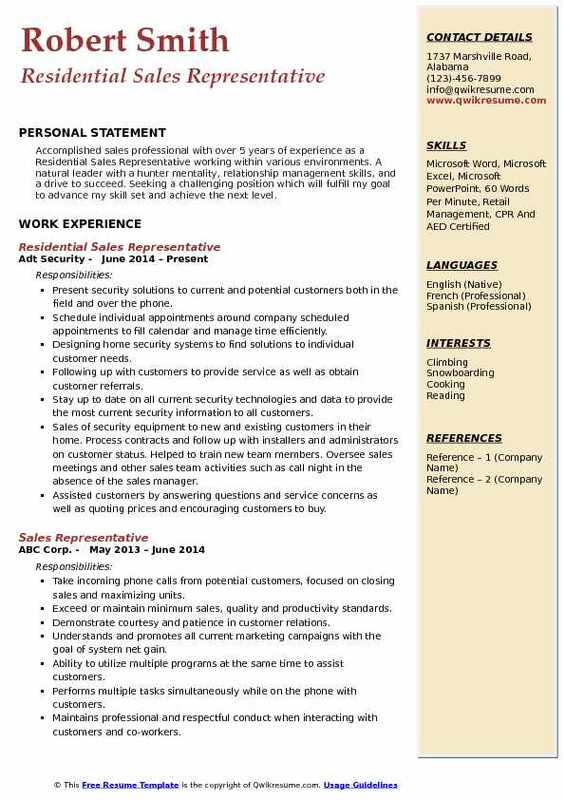 Skills : Detail-oriented, Microsoft Products (Excel, Word, PowerPoint, Project, Access), Excellent Computer, Excellent Organizational, Marketing, Outside Sales, Problem Solving, And Analytical Planning. Write and present business proposals to established and prospective clients. Applying specific knowledge regarding safety and technical policies/procedures. Establish, evaluate interpret compliance with technical requirements for installations. Responsible for resolving problems; identifying/analyzing trends and responding to customer needs. Fostering strong relationships with customers and strategic associates to elevate brand awareness. Develops customized solutions based on the clients need using lawn care products and services. Conducts follow-up of leads and customer retention/service calls via phone call or face-to-face contact to identify customer needs. Manages a local route selling programs and services to current and prospective customers over assigned territories.